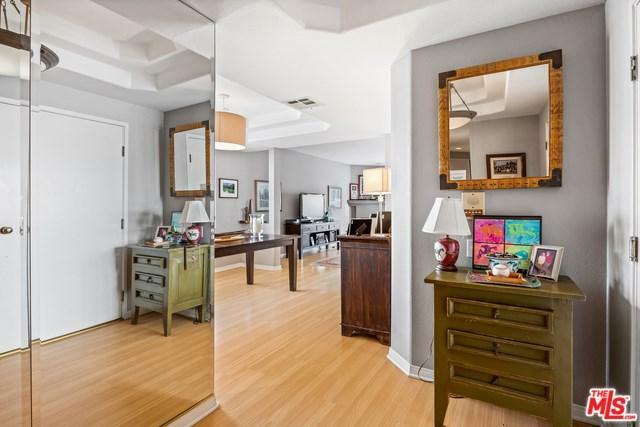 Beautiful corner-unit 2 bed/2.5 bath w/ no common walls in desired smaller 9-unit complex. Feels like a home as you enter double doors opening to inviting formal entry with soffit ceiling. Spacious living room w/ marble-finished hearth, french doors to front facing balcony w/ tree top views & large storage closet. Formal dining room w/ soffit ceiling & built-in cabinets & bar area ideal for entertaining guests. Sunny kitchen w/ gas range top & built-in microwave. Large master suite filled with natural light, 2 large closets & built-in linen cabinet. Master bathroom w/ vanity, dual basins & separate spa bath & shower. Spacious 2nd bedroom w/ large closet & ensuite full bath. Additional features include contemporary wood-like flooring throughout, central ac/heat, plantation shutters, newer shades in bedrooms, laundry in-unit. No Pets, secured tandem parking w/ large additional storage locker, guest parking. Prime location within a few blocks to Brentwood's finest retail & restaurants. Sold by Shelli Broder of Berkshire Hathaway Homeservice.